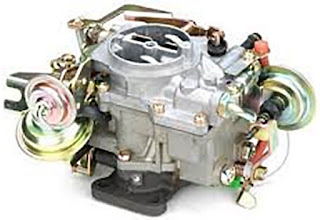 Function and How it Works Carburetors - Carburetors are one component of motor vehicles such as motorbikes or cars. You could say the carburetor is like a vehicle ammo. Without a carburetor, the vehicle has no meaning. So that the carburetor must always be maintained and functioned as well as possible. Mixing the gas and uradara fuel in the right ratio, which is about 1 gram of fuel versus 15 grams of air. Carburetors work based on the existence of natural law, if air flows from a small room it will cause the velocity of uadara flowing in the small space to get bigger and the pressure decreases (decreases). The small room inside the carburetor is called a venturi and is generally connected to a spuyer that is connected to the bowl where the fuel (the Float Chamber) will be sucked up through the next sepuyer, the fuel will be a fog / gas form, this drainage is the piston movement in the cylinder. Now that's the explanation from me regarding the function and the way the carburetor works, hopefully this tutorial will benefit us all. do not forget to continue to visit this blog to get other automotive knowledge, and if anything is not understood just comment on the comments that have been provided. 0 Response to "Function and How it Works Carburetors"